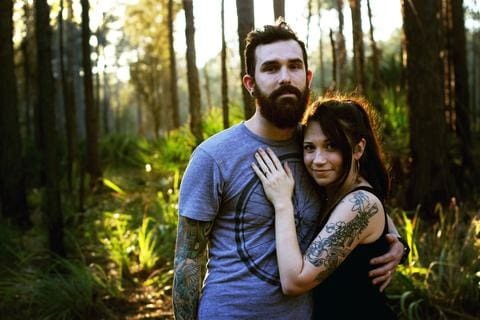 Located in Tampa, Florida, Dark Cycle Clothing was founded by husband and wife team Coryn and Adam in 2009. Adam and Coryn have been playing around with designing t-shirts since they were teenagers in love bringing their late-night design creations to the local screen-printer and peddling them in batches of 20 at local punk rock shows. Eventually they bought a press of their own and began printing for local businesses in Tampa, Florida. The concept for Dark Cycle began with Adam thinking up quirky animal on bike designs while making his 17-mile bike ride to work. Eventually, he screenprinted the designs up on some extra t-shirts and they generated quite a bit of interest every time they were worn. After some friendly nudging from Adam, for longer than Coryn cares to admit, she posted the shirts up at darkcycleclothing.etsy.com and the next three years became a blur of chasing their little ones around, while tirelessly designing, printing, packing and shipping Dark Cycle shirts to every corner of the world. In 2010 Stephanie joined the team and is currently the backbone of their customer service and wholesale rep and is fantastic at getting back to customer queries within 24 hours and hooking them up with custom work. Over 15,000 happy customers later, in 2011 they decided it was time to branch out on their own and start Darkcycleclothing.com. Now with over 100k happy customers and with their shirts in over 100 small shops worldwide, each shirt is still hand screen printed with care in their three person shop. Dark Cycle Clothing's mission is to provide ethical and quality clothing while promoting alternative transportation.